Welcome to Sherrie Scraps with Passion and the Cre8tivegirls Blogoversary Blog Hop We hope you have fun and find some inspiration along the way. We have a great lineup of talented ladies to inspire you!! So, lets get hoppin:) If you happen to stumble upon my blog and would like to play along, please do so by starting at Yvette's blog over at Cre8tivegirls. My shaped wine bottle/glass card was cut from the Celebrate with Flourish cartridge. I used my gypsy and welded them together at 10.05 x 4.92 plus all the layers. I cut the "1" from the Birthday Bash cartridge at 1 3/4 to attach it to the card and another one cut at 2 3/4 for the tag. The tag was cut from Birthday Bash cartridge as well at 3 1/2, 3 1/4 and 3" to layer it for more dimension. The lovely sentiment is from Hero Arts. I added a couple cute prima flowers, twine and a button to finish it up. Be sure to stop back tomorrow for another project! ** I will be posting a project all three days and will "combine" all comments to choose "1" winner, via random.org and post the winner on Mon Aug 8th****Please note, due to shipping I can only accept USA & Canada entries. Your next stop is Giselle. 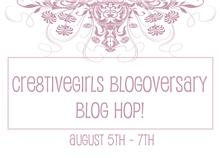 Be sure to stop back tomorrow for Day 2 of the Cre8tivegirls Blogoversary Blog Hop!!! Super project! Great details! Super Already a Follower! What a beautiful idea you have made!! This is beautiful, you're are so creative! Such a fabulous project. The colors are perfect. The card and tag are just gorgeous. Is that a wine gift bag that the wine is actually in. I love how it has a pleated look to it. What a great gift for a 1st anniversary! Thanks for the wonderful idea. Hugs! what a great card. very nice. tfs. i've been a follower for a long time. Very cute idea, I am already a follower! So sorry, I thought I was already a follower... I am now. Just gorgeous, both of them!!!! Hi Sherrie! I love your project -how creative!!! What a super gift for the happy couple. Thanks for your sweet and encouraging comments on my blog. I am now a follower of yours and look forward to seeing your project tomorrow and in the future. Such fun being in the hop with you and the other ladies! Super cute. I love the wine bag. Your card is gorgeous, great job! Super creative and cute! Lovely job as always! Absolutely beautiful! What a wonderful idea. I need to scraplift this! ;) TFS! My little sister's first anniversary is coming up, thanks for sharing this great idea! I'm already a follower. Thanks for the chance to win! OMG, Sherri!!! I absolutely love this set!!! This is one fun and creative hop!!! Holy macaroni - how beautiful is that! Beautiful Sherri - TFS! this is awesome- how creative. I would have never thought of a wine bottle card. I have been a follower for a while. Already a follower. Your card and tag turned out beautiful :) Nice work! What a beautiful project you created. I'm a new follower. Thanks for a chance to win some yummy candy. I love this. Very different and great for any anniversary. Wow! This is amazing. I love the idea behind it. Thanks for sharing. Already a follower. VERY pretty! I am a follower. I'm a follower & have been for awhile. Like the wine bottle creation. Embossing folders are a fav of mine. Super cute card love the shape! Great job! I am already a follower. This is a fabulous design. So creative and rich with color. New follower here. Great inspiration. I LOVE this card and tag combo. They look great, awesome gift!! The card is awesome!! Love the creative use of the shapes! Very sophisticated looking card! I love the colors! TFS. What a treat: a 3 day blog hop!!! :) I love your cute card and tag! I have to learn how to use my Gypsy, so shaped cards are easier to make. What a beautiful project! Your color choices are always great. Awesome card w/matching tag. Very elegant. wow this is beautiful... and someone please bust out the glasses, I could enjoy that about now hehehe! Thanks so much! Such a cute card! Perfect to go with the bottle of wine! I love the idea! I'm already a happy follower! !